“Make sure you know what the centre wants, then decide if you want to be part of the organisation. 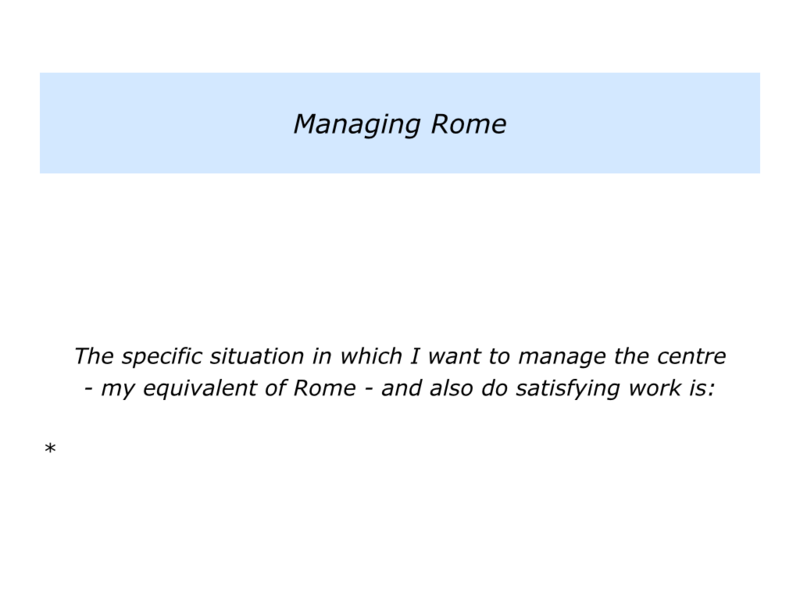 “If you do, follow the organisation’s overall guidelines and deliver outstanding results that will satisfy Rome. “Take your taxes and trophies to the centre, but don’t let them supervise your tactics. If you join an organisation, then morally you must satisfy the centre. The organisation is paying your wages. Your job is to help it to succeed, but sometimes this can be challenging. To make clear contracts about the specific results – the Scorecard – your team must deliver to satisfy the key stakeholders. To ensure that your team delivers the specific results and also does stimulating projects that help the organisation to achieve success. To continue to do satisfying work, maintain your wellbeing and, when appropriate, decide whether you still want to contribute to the organisation. Every organisation has a Scorecard that it expects its people to contribute towards delivering. Most organisations want to improve the 3 Ps: their profits, product quality – including service quality – and people. Looking at the world from the centre’s point of view, clarify the specific results they will want delivered. These will probably be translated into your team’s Scorecard, the mandatory things it will be expected to deliver. Different organisations communicate and implement the Scorecard in different ways. The different approaches they use have different consequences. Great organisations get the right balance between the Global and the Local. 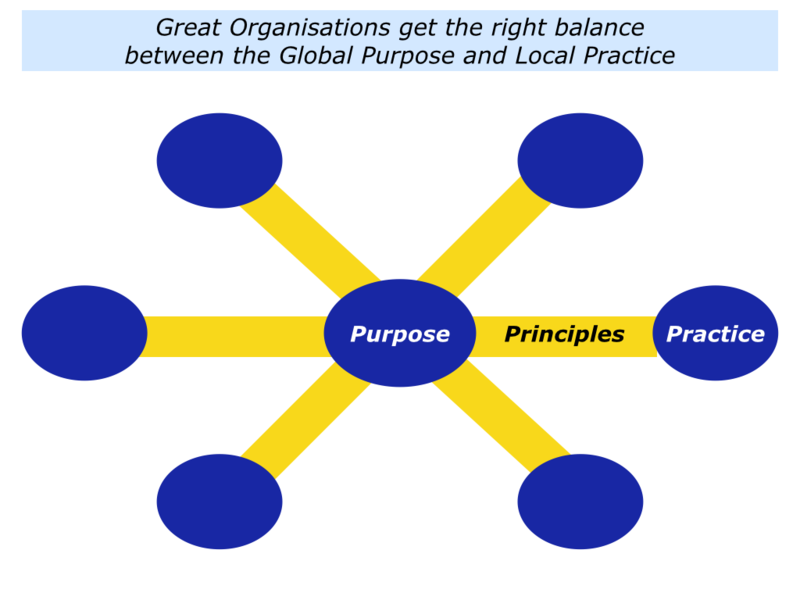 The centre communicates the organisation’s purpose and principles. They then give people local autonomy to put these into practice. Such organisations manage by outcomes, rather than by tasks. They make clear contracts with the satellites about the outcomes that must be delivered. They then expect the satellites to deliver the agreed outcomes. The satellites must proactively keep people informed about their progress and also deliver the goals. This is how they retain their autonomy. Some organisations follow a different route and make life difficult for their people. There are several warning signs. One warning sign is that the centre manages by tasks, rather than by outcomes. They have a detailed manual about how things must done and process police who supervise people. Other warning signs are that the centre does not have a clear vision for the future or that the goal posts keep changing. The satellite’s job is to then manage the centre. How to make this happen? To clarify the specific results your team will deliver towards achieving the organisation’s Scorecard. To show the key stakeholders how delivering these things will contribute towards achieving the organisation’s Scorecard. To make clear contracts about what your team will deliver and how it will proactively keep people informed about its progress towards delivering the Scorecard. Even in the absence of an overall organisational aim, you can assume it wants to improve its profitability, product quality and people. You can show how the things your team will deliver will contribute towards these goals. Managing the centre in this way can be exhausting, but it is the only way to survive. There is also another factor to bear in mind. Make sure you are comfortable with the overall culture. Marvin Bower defined culture as: ‘The way we do things around here.’ This includes the things you will need to do to manage the centre. Bearing in mind the organisation’s culture, decide if you want to contribute towards achieving its goals. Make sure that the rating is at least 7+/10. Anything less is a danger signal. Let’s assume that you want to want to contribute, you can then prepare properly for the contracting meeting. How to handle this session? “We can deliver those results. Are there any other things you want delivered? You can agree with the centre on ‘What’ you will deliver and by ‘When’. Follow up the meeting with an email confirming the agreed contract. This then becomes your team’s Scorecard. This process can take some time, but it should result in knowing what must be done to satisfy Rome. It is then time to move onto the next stage. Be super professional and do whatever you can to satisfy the centre. This also involves proactively keeping the key stakeholders informed about the progress towards achieving the goals. At the same time, however, it is vital to help your colleagues and customers to achieve success. 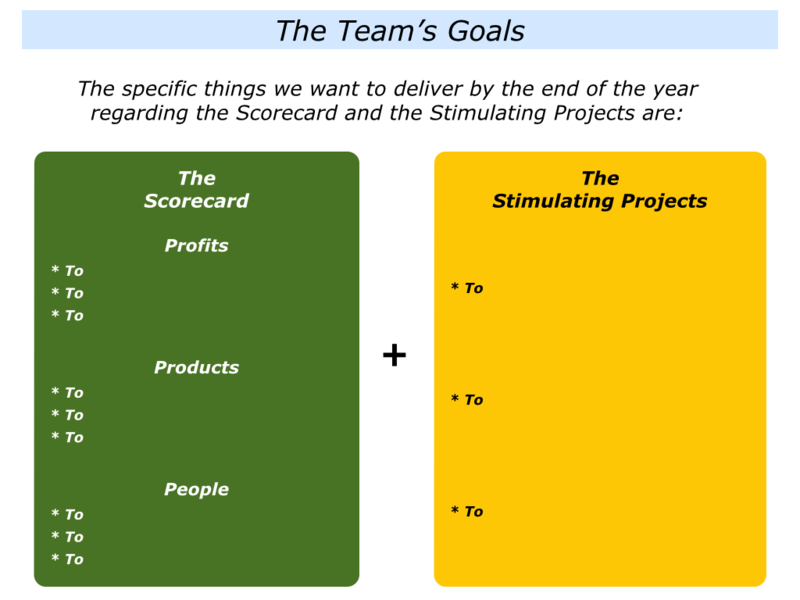 Your team members will need to deliver the Scorecard, but it can be important for them to also pursue additional stimulating projects. How to make this happen? One leader explained their approach in the following way. To fight the centre about the Scorecard. To grumble about the Scorecard and let it dominate our lives. To complete the parts of the Scorecard we believe in. To deliver the Scorecard – but in a way that is creative – and get on with doing other stimulating work as well. “I tell the people who join my team that we are going with final option. This is the way we can keep the centre off our backs and create the space to do other good work. “Bearing this in mind, I do the following exercise before the start of each financial year. Looking ahead, my team focuses on how to do the following three things. To deliver the Scorecard and satisfy our key stakeholders in the organisation. To use our individual and collective strengths to do stimulating projects that will deliver benefits for both the customers and the organisation. To translate these projects into success stories that can be published and deliver benefits for the organisation. “Each team member clarifies the projects they want to deliver. Again, it was vital to show how these can benefit the organisation. “In practical terms, this also means passing on some of the other tasks to members of their teams who want to prove their worth. “Eventually we settle on the projects to deliver, the support required and when people will produce the success stories. “We deliver the Scorecard and also aim to do satisfying work. But there is a proviso. “One day it may be that the Scorecard becomes debilitating. If so, then we each need to make a choice. You will have your own approach to ensuring your team delivers the required specific results. At the same time, you can provide air cover to give them space to deliver the goods. When doing this, it can be useful to take the following steps. To proactively keep your stakeholders informed about the progress towards achieving the agreed goals. To put yourself in their shoes and think ahead about the challenges they will be facing in the future. To clarify and then show how your team can help them to manage these challenges and contribute to the future success of the organisation. 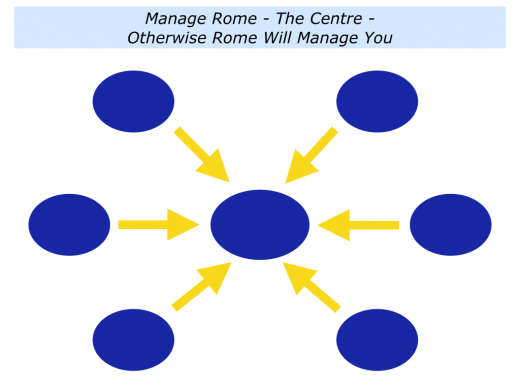 As ever, the motto is: manage the centre, otherwise the centre will manage you. “During the first three years it was relatively easy to manage the centre, providing we delivered the results,” explained one MD. “But then new bosses arrived, complete with an operating manual that asked our people to behave like robots. “They claimed to want to introduce consistency – which is fair enough. But it was consistency of internal procedures and scripts for sales people – rather than consistency of outcomes. Your physical health – check whether you feel energetic or exhausted. Your psychological health – check whether you feel satisfied or dissatisfied in your work. Your philosophical health – check whether you feel aligned with your organisation’s purpose or feel alienated. Be aware of the warning signs. Being professional, you can then try to make clear contracts with the centre and regain your sense of fulfilment. If this does not work, it may be time to move on. Wherever you go, however, it will be important to learn how to satisfy the key stakeholders. After all, they do pay your wages. Managing the centre properly means you will fulfil your moral contract and make life easier for everybody. 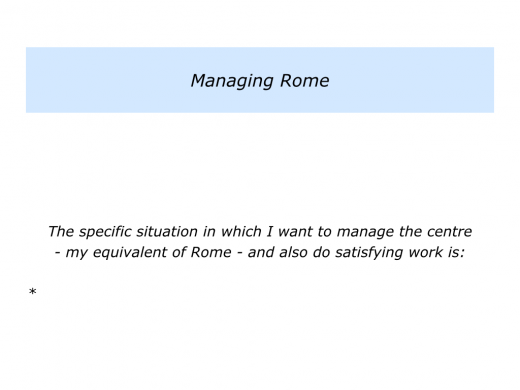 Describe a specific situation in which you want to manage the centre – your equivalent of Rome – and also do satisfying work. 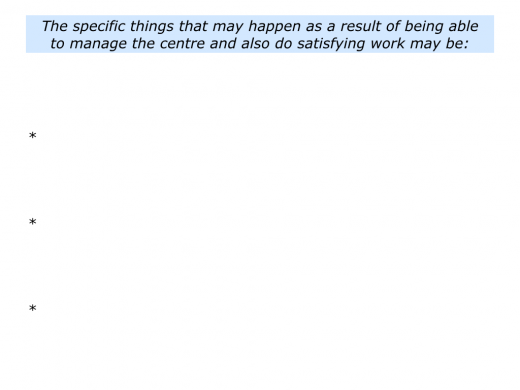 Describe the specific things you can do to manage the centre and also do satisfying work. Describe the specific things that may happen as a result of being able to manage the centre and do satisfying work.